In this issue of the Gordon art Place newsletter I am presenting an article on Surrealism. As many of you know, I am a “figurative abstract surrealist.” Therefore, I feel that it is appropriate for me to provide some explanation about surrealism and its historical development. This material was first presented as an Artist Talk, on Abstract Surrealism during my show…”Inside a Surrealist’s Mind” for an exhibit at the Lark Gallery in Hawthorne, CA on May 28, 2016. Here are some descriptive words about surrealism. By thinking about these words and how they relate to your notion of surrealism, you can begin to derive an understanding of what surrealism is and work towards a definition of surrealism and what are some of its characteristics. “Surrealism” is actually a twentieth century avant garde movement in art and culture in which creativity is reflected through the juxtaposition of relationships, various views of reality, and stream of consciousness, sometimes whimsical, political or futuristic. Some would say twisted or distorted reality - even dystopian. I would say it is an expression of unconventional reality. 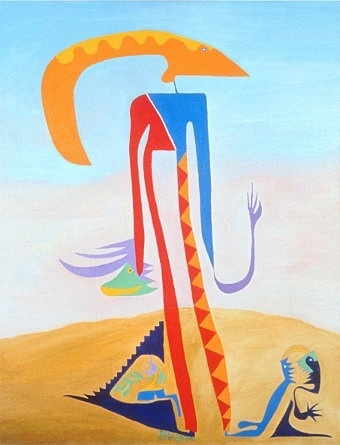 Some of the best known surrealists are listed below. In fact, there are many more than could possibly be listed here. If we included the artists influenced by surrealism, the list would be even longer - and could almost include many if not most artists of the day. Surrealism has had a profound influence on art and culture ever since its origin. We are all born into a culture, a society and a time period of artists. We could not have surrealism without impressionism. We would not have impressionism without all the earlier stages of artistic development. However, we in the west are ethnocentric and ahistorical in the sense that we think our developments came first or are more important than others. The primitivists, art naïve and tribal art from Africa, South America, and other places preexisted some of what we call more modern artistic periods. In fact it is known that among others, Picasso and other surrealists were influenced by art from other cultures. So we can deduce that art is universal, though reflects the culture into which one is born. I believe that artists are all art historians without necessarily studying art history. Even the most unique artist could not exist artistically without predecessors and previous influences. Surrealism has developed from the impressionists and earlier art forms such as cubism, the “dada movement” and some would say the futurists. All artists make their own contributions, but within their oeuvre can be seen the influences of their predecessors. Classical surrealism - in which the painting style and imagery is classical and mostly realistic but of unconventional presentations and sometimes distorted reality. Some examples of “classical surrealists” are Dali, Magritte, Tanning, Sage and Carrington. A much earlier precursor to surrealism is the Dutch painter Hieronymus Bosch from 1450-1516…But that’s another story. Futuristic Surrealism - imagery is futuristic, sometimes dystopian, often people are minimized, and voids are emphasized; can be photographic or “slick” imagery like recent advertising trends. Some examples of futuristic surrealists are Tanguy, Di Chirico, Man Ray, Kay Sage is transitional between classical and futuristic. Abstract Surrealism - Uses more abstract forms and is less concerned with conventions, representations and standard relationships. 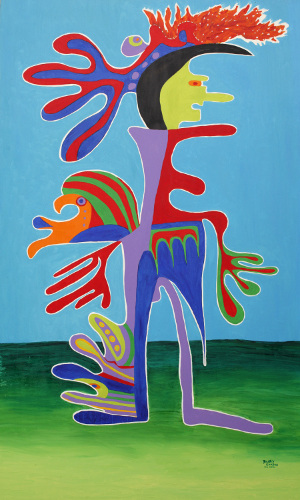 Some examples of “abstract surrealists” are Picasso, Miro, Ernst, Matta, Klee, Kandinsky, Giacometti, Arp and Brancusi. My brand of abstract surrealism is also figurative and influenced by Saul Steinberg (a Romanian-American artist between serious cartooning and expressionistic and graphic drawing); by UPA Cartoons (from the 1950’s - Mr. Magoo, Gerald McBoing Boing) and by tribal and so-called primitive art forms such as Native American, Oceanic, African, Asian, and South American art forms. In my mind, being “figurative” also helps people to more easily have access to a beginning-understanding or the organization of the imagery. When people ask me to describe my art and it’s derivation, I tell them to think of a large pot. 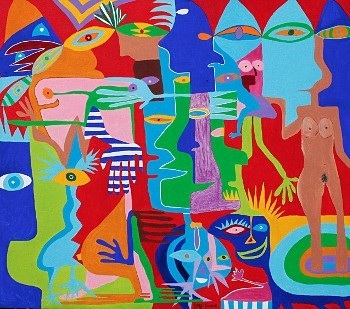 Add the imagery of Picasso, Miro, Dali, Saul Steinberg, Paul Klee, Matisse, Matta, Tanguy, De Chirico, Ernst, Arp, Brancusi, and Kandinsky…and let the pot bubble and boil - and from that mix you get the direction of my unique imagery. I am a sociological…figurative…abstract…surrealist artist. 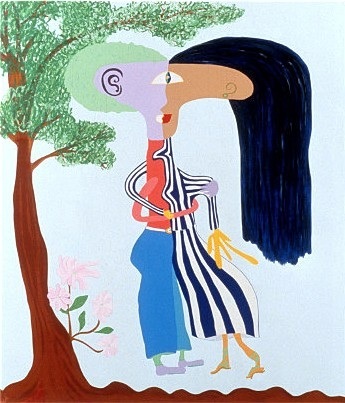 My works are often about people, relationships, mind, self and society; love and romance, humor, whimsy, music (such as jazz); biomorphic and human forms; birds, flowers and trees. In today’s complex world, surrealism and it’s influences may paradoxically help the viewer to better understand their social context precisely because of the kind of “distortions” emphasized by the surrealist imagery. Perceptions may be changed or be discovered. One does not need to always consciously be able to analytically understand an artwork. Sometimes a visceral impression is tantamount to appreciating the artwork. The key to art appreciation and it’s enjoyment is how well the viewer’s intellect interacts with and is stimulated by the imagery. The appreciation can be holistic or specific, regarding color, design, use and organization of space, texture or the imagery itself in terms of message or lack of message or even lack of image. 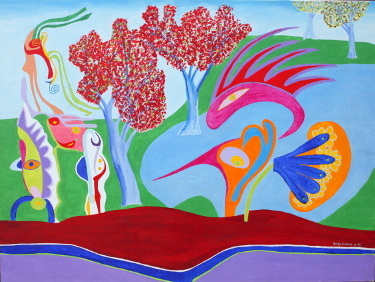 Thus, abstract surrealism presents the opportunity for a unique journey. A juried show consisting of 72 artist’s booths. My booth will have a variety of artwork at a variety of price-points, including Oils on Canvas, new bronze and resin sculptures and drawings and etchings. The exhibition is ON Colorado Blvd and El Molino Avenue in Pasadena. A group show of twelve professional artists all members of Gallery 825 (LA Art Association) West LA Critique Group 2015-16. If you enjoyed this newsletter then subscribe to get more delivered to you.